We live in an extremely hot country and afternoons could be very uncomfortable if there weren’t Air Conditioners. Cooling your homes/office is an AC’s job and keeping them working is ours. A Handyman provides the best air conditioning services in Bahrain. Whether your AC is not cooling or is dripping water, our experts can handle any AC problem with ease. We can handle each and every problem associated with Air Conditioners. Our workmen are the best in all of Bahrain. We even do AC maintenance works. Whether you need to refill your gas tank or want your filter dusted, just give us a call/drop us an email, and we’ll be there. Leave all your worries to us. We work on home air conditioners as well at offices too. We can handle split ACs, centralised cooling systems and all other air conditioners with the same efficiency. We keep updating our knowledge and equipment to ensure our air conditioning services stay the best in all of the country. We’ll make sure you can sit comfortably in your office or sleep well at home. Our professionals will never give you a chance to complain. The work begins when you book an appointment with us. We are available for call on scheduled appointment as well as on emergency. After we get a booking, our team will visit your home/office or workplace. In case the issue is minor, our team will fix it immediately and will generate the invoice too. In case the work is bigger and would take more time than just an hour or two, our experts will take a thorough look at the problem and suggest a suitable solution. We’ll also give you an estimate of the total amount of work that would be required and a probable cost involved. Although we charge a modest visiting fee, we’ll waiver that off in case you decide to let us do the complete work. After the complete work is done upto the satisfactory level, we’ll present you the final invoice will all the details of material’s cost(if any), labour charge, taxes, etc. After that, final payment is collected, and the project is completed. Why is our AC Service the Best in Bahrain? We believe in progress through challenges. We constantly challenge ourselves and test our limits to improve our skills and stay on the top of our game all the time. We keep training our workmen, imparting latest trends, technology, and equipment to keep them updated and stay above the competition. We have been in the business for more than ten years with the same zeal and enthusiasm. Our workers are not only skilled but also experienced and licensed. All of these qualities in our employees keep us moving ahead and making our services best in the country. Why an AC Maintenance Service? Air Conditioners are essential for us, our lives would get really difficult without them. They need to be kept running perfectly all the time. Trying to repair a broken AC fan, or attempting to fix a gas leakage yourself might cause the problem to worsen. Also, there may be a more than what appears to the eye. An expert, by virtue of their experience and knowledge, can diagnose the exact problem and solve it right away. Hiring a professional to take care of your problem will definitely solve your AC problem. 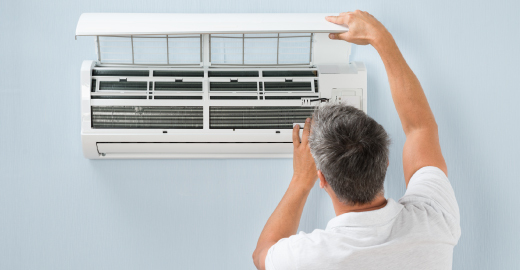 Our air conditioner maintenance services include installation of ACs in your home/office, repairing broken or non-working ACs, perform checkups to ensure smooth working of the ACs/AC systems in place, perform all major/minor maintenance on the same. Handyman is available for calling on all days. We take bookings and appointments every day. You may book an appointment with our team between 8AM-8PM on any day. You may call us to pay you a visit in advance or on an emergency. Our commitment towards our work makes our services the best in Bahrain. Bahrain is an arid country where we are constantly under the hot sun rays. The heat gets intolerable, especially during summers. With little to no rainfall in our nation, there is barely any relief from the Sunny climate of our country. Air conditioners are the best to give some relief from the unbearable heat outside. Air conditioners use the principle of refrigeration where a compressed gas is used to generate the cooling effect. The cooled air is then circulated across the room/hall. Air conditioners make the life of most of the Bahrainis easier. With ACs installed in cars, homes, shopping malls, office, public places – virtually everywhere, the need to keep them running good arises. For a home/small office, a couple of split ACs are enough to provide cooling. However, for relatively larger places such as big shops, we may need a centralised air conditioning system. Our experts can handle all types of installations, right from small to large ones with equal ease and professionalism. What Air Conditioner maintenance consists of? We’re experts at maintenance of all kinds of Air Conditioners and AC Systems. We can visit you at your convenience to check all systems and make minor repairs if necessary. Our experts will take care of each and every small detail, like checking the remote, cleaning the dust filter, checking the gas pressure, etc. What is covered under repairs? We don’t just install and maintain Air Conditioning systems; we repair them too. Whether your AC is leaking a lot of water or is not cooling, or if you smell foul air from your AC or if your AC’s fan isn’t working, just let us know. We’ll be there and solve your problem in no time. No problem related to an AC is unsolvable by our experts. We can totally fix any repairable to make it work as good as new.